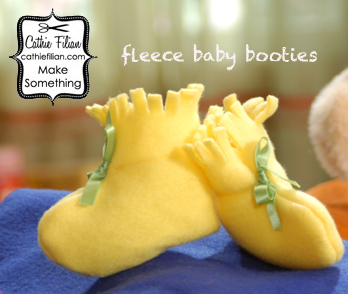 Keep your kids’ feet nice and toasty with incredibly cute, easy-to-make fleece booties. 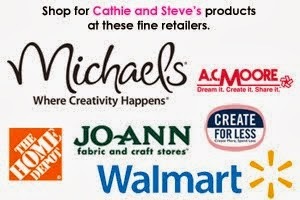 This project is from the Babies episode of Creative Juice on HGTV & DIY. 1. Pin the pattern in place on the fleece fabric (make sure you place the pattern on the fold of the fabric) and cut around the pattern. Repeat this for the second bootie. 2. Remove the pins and open the booties up, place them right sides down. 3. Cut the elastic in half (1 piece for each bootie) and following the pattern, sew stretched elastic across the appropriate stitching line, repeat on second bootie. 4. Fold the bootie in half (rights sides together). 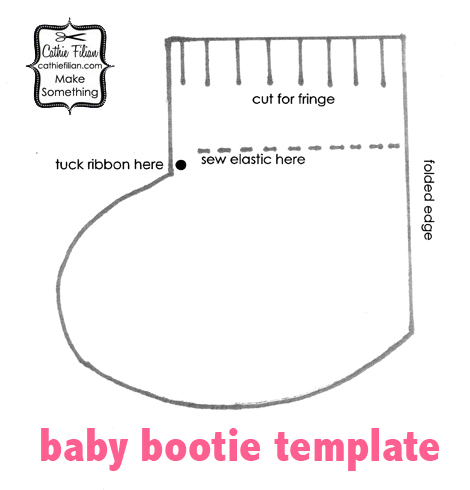 Cut the ribbon in half (1 piece each bootie) and fold the ribbon in half and pin in the marked spot (see pattern). Pin and sew around the edge with a 1/4-inch seam allowance. 5. Turn right side out and tie the ribbon in a bow. Use your scissors to cut fun fringe at the top of the bootie. Repeat steps 2-4 for the second bootie. click to download - enlarge or shrink to adjust the size. oh wow! these booties are sweet! thanks for sharing. I make these booties alot for the babies in my life. I saw these Creative Juice a couple of years ago. I love them.